The image had originated from a Twitter account named "oregon4TRUMP," as a reply to one of Trump's tweets boasting about his first-year achievements. President Donald Trump on Christmas Eve retweeted a doctored image with the CNN logo imposed on a bloodlike splatter under his shoe, prompting an outcry - with critics deeming the picture and its timing offensive. "So many things accomplished by the Trump Administration, perhaps more than any other President in first year," Trump had tweeted Saturday afternoon. "Sadly, will never be reported correctly by the Fake News Media!" "Thank you President TRUMP!!" oregon4TRUMP replied, adding an apparently altered image of Trump in the back of a car with the crushed CNN logo on the sole of his left shoe. 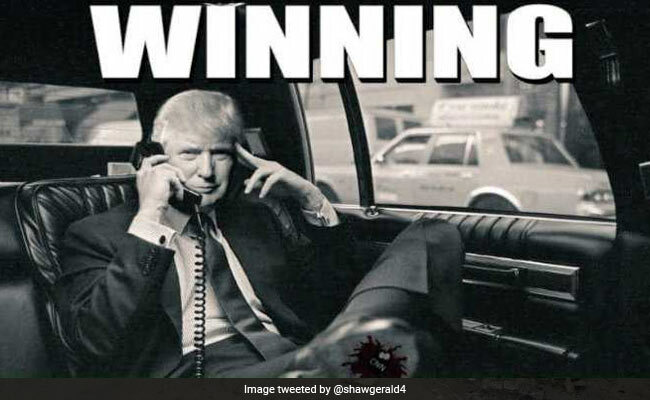 The image had additional text superimposed on it that read, "WINNING." On Sunday morning, in between tweets promoting a conspiracy theory about FBI Deputy Director Andrew McCabe and attacking "Fake News" and "Fake Polls," Trump retweeted the image to his more than 45 million followers. The tweet compelled Walter M. Shaub Jr., former director of the independent Office of Government Ethics, to again break a self-imposed holiday Twitter hiatus to admonish the president. Shaub resigned from his post in July amid clashes with the White House, and he has since been an outspoken critic of Trump on social media. "The wannabe autocrat just retweeted an image depicting CNN's blood on the sole of his shoe," Shaub tweeted Sunday. "These colicky tweets reveal he's hurting this weekend. They make him (and our country) look weak." Joe Walsh, a conservative radio host and former Republican congressman from Illinois, also criticized Trump for attacking CNN - and the FBI - on the morning of Christmas Eve. "Mr President, put your phone down. It's Christmas. Quit attacking people on Twitter," Walsh tweeted. "Grow up sir. Have you no sense of decency? Go spend time with your family." CNN anchor Jake Tapper noted Trump's tweet with a simple observation: "CNN-labeled blood on the sole of his shoe. Retweeted by the President of the United States on Christmas Eve." In response to Tapper, Jason Osborne, a former Trump campaign adviser, defended the image and accused Tapper of "(making) everything about your network." The image was of a bug because it "clearly has eyes," Osborne insisted. He also argued that Trump may not have noticed the CNN logo at the bottom of his shoe and retweeted the picture because he liked the way he looked in it. Tapper replied: "The president retweeted an image of blood labeled 'CNN' on the sole of his shoe. I noted it. Trump Adviser now faults *me* for 'making this about' CNN. God bless us, everyone." Trump has had a contentious relationship with the press since his campaign, regularly lashing out at certain media outlets - even individual journalists - and accusing many publications and news stations of being "fake news." CNN has regularly been the subject of Trump's attacks, on Twitter and in speeches. Earlier this month, after CNN apologized for mistakenly reporting the timing of a WikiLeaks-related email, Trump used the error as an opportunity to attack the network again. "CNN apologized just a little while ago," Trump said at a rally in Pensacola, Florida. "They apologized. Oh, thank you, CNN. Thank you so much. You should've been apologizing for the last two years." Sunday's tweet was not the first time that Trump has shared a doctored image on Twitter, particularly related to CNN. In July - on another Sunday morning, just before Independence Day - Trump tweeted an edited video clip that showed him slamming a man with "CNN" superimposed on his head to the ground. In the video, Trump then throws punches at the man's head, before walking away. Trump appended the tweet with two hashtags: "#FraudNewsCNN" and "#FNN." "Joy echoed across r/The_Donald, which a day earlier had been more interested in conspiracy theories about the Clintons killing people and stick-figure drawings of Californians embarrassing themselves. "'We all wish for such validation.'" In September, a few days after the racially charged unrest in Charlottesville, Virginia, where a car plowed into counterprotesters rallying against white nationalists and killed a woman, Trump retweeted an image of a train running over a CNN reporter. "Fake news can't stop the Trump train," the image read. It was later removed from Trump's account.